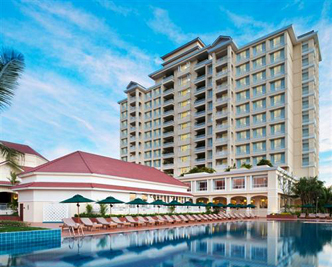 Sofitel Phnom Penh Phokeethra is set riverside amongst landscaped gardens in the old quarter of the city. This stunning well-located 12-storey colonial style hotel is close to key attractions, embassies and the central business district. Along with 201 luxurious rooms and suites with Mekong or Bassac river views, this beautiful hotel offers an array of chic restaurants and bars, an upscale spa, two swimming pools, a sports club and the finest conferencing facilities in Cambodia. Sofitel Phnom Penh Phokeethra in larger map.